HUFFMAN  According to Detective Ben Beall of the Harris County Sheriff’s Homicide Division, Janice Byrnes has been charged with the murder of her father. Neighbors say that many times Sheriff’s Deputies and other officials have been called to the 1300 block of Gum Tree Lane concerning loud arguing and fighting. 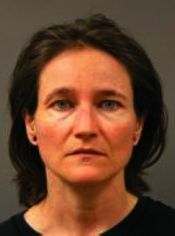 Officers say, July 26 Janice Byrnes walked to a neighbors house, and told that neighbor that she murdered her father. Deputies responded to the scene and located the body of John Byrnes within his home. He was killed by blunt force trauma to the head. Janice was taken to the Harris County Sheriff’s Office Homicide Unit and questioned. Janice Byrnes stated she and her father argued on Sunday and she became very angry and blacked out. Several hours later, she realized her father was deceased. Janice Byrnes is charged with murder in the 208th District Court with bond set at $75,000. The case is being investigated by the Harris County Sheriff’s Office Homicide Unit. If anyone has any information regarding the death of John Byrnes, they are asked to contact the Harris County Sheriff’s Office at 713-274-9100. HIGHLANDS  The San Jacinto River Coalition held their regular monthly meeting Tuesday night, with about 150 attending at the Community Center. But instead of hearing information on the possible contamintion in their well water, they had to wait a few more weeks, said Jackie Young. After attending a meeting with Harris County Public Health, she was unable to provide the definitive information that the audience asked for. They wanted a detailed quantitative report on dioxins, and other contaminants in their water. Jackie Young, executive director of the group, gave a history of the organization, her involvement, and status of the EPA study of the waste pits. She also played a video of Congressman Gene Green, questioning EPA director Mathy Stanislaus on EPAs plans to remediate the Superfund Site. The reply was that a study was almost complete, and an answer with a public comment period would be ready by the end of summer. Green emphasized the time critical nature of the remediation, since many people were experiencing health concerns and problems. His comment on the video to Stanislaus, We want it cleaned up. We want it completely removed. Young also produced a letter from Congressmen Brian Babin, and Randy Weber, expressing the same sentiment and asking for complete removal.